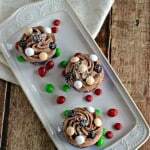 It’s the 9th Day of Christmas on Hezzi-D’s Books and Cooks and today I’m sharing an easy but delicious holiday dessert! 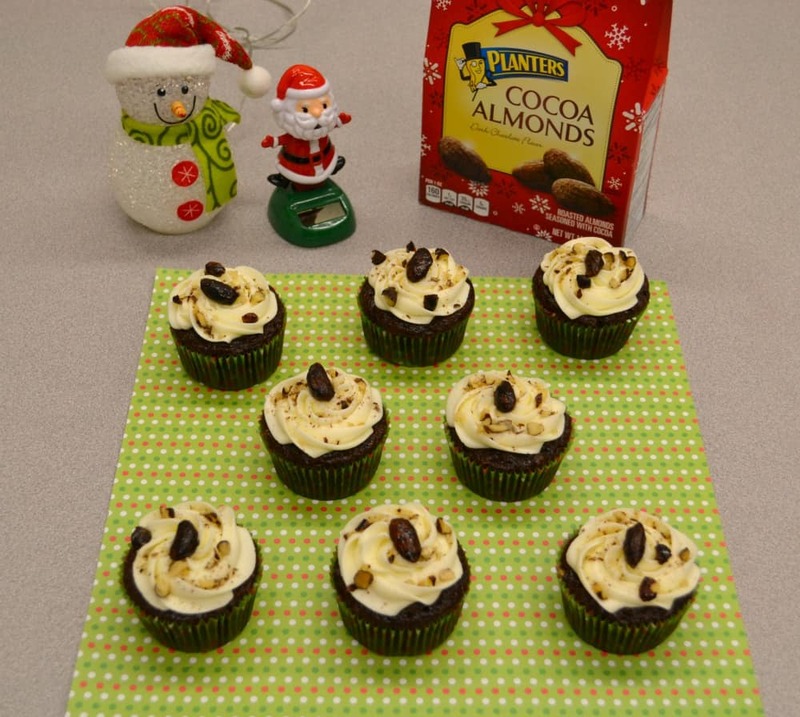 It’s a rich chocolate almond cupcake topped with almond frosting and sprinkled with Planter’s Cocoa Almonds. 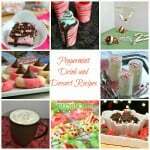 It’s the perfect dessert for a holiday party or even for Christmas Day! My idea didn’t actually form for this cupcake until I was at the store. 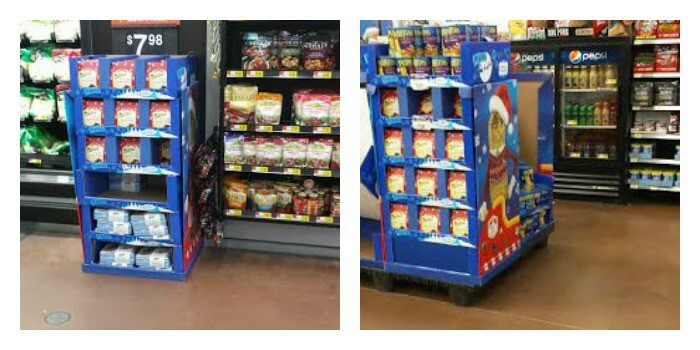 As I was walking through Walmart I noticed a large sleigh display of Planter’s Seasonal Nuts. The Cocoa Almonds immediately caught my eye and I grabbed a bag of them thinking they would look so pretty sitting on top of a cupcake. 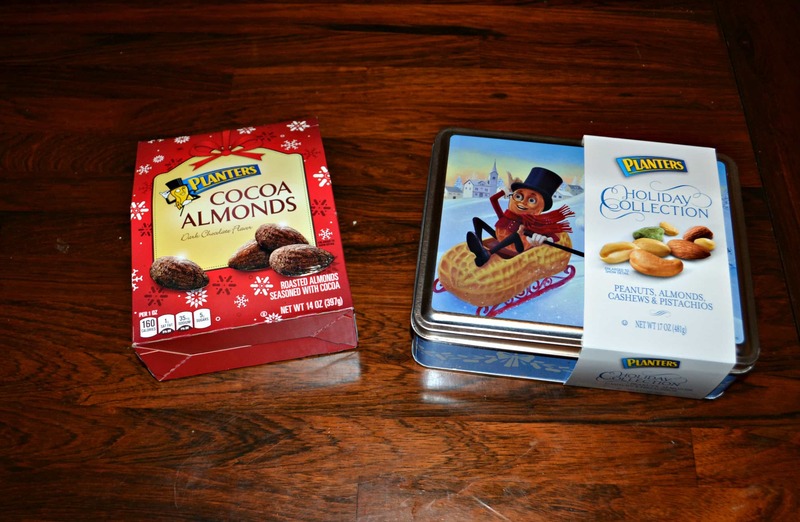 The other seasonal nut that grabbed my attention was the holiday collection tin. It is filled with peanuts, almonds, cashews, and pistachios all in a beautiful holiday tin. I grabbed one of the tins and figured I would give it to either my dad or my great aunt for Christmas. They both love nuts and the tin is decorative enough that I can just put a bow on it and gift it. Speaking of nuts, have you heard of the Blippar app? It’s pretty cool. It uses digital recognition to interact with a product. I used it on the Planter’s Cocoa Almonds and was given the option to take a selfie with Mr. Peanut, browse a list of seasonal Planter’s items, or to browse a few holiday recipes. 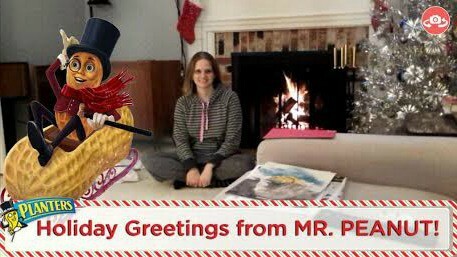 I immediately clicked on the selfie feature and had my husband take a photo of me with Mr. Peanut in front of the fire. Aren’t we cute? I had a lot of fun taking photos with Mr. Peanut in front of my tree, eating the Cocoa Almonds, and even outside. I also enjoyed browsing the easy holiday recipes. They gave me some ideas for making a holiday recipe of my own. After I finished playing with the Blippar app I started thinking about how to use the chocolate almonds in a cupcake recipe. I finally came up with the idea of a chocolate cupcake with almond frosting. While I wanted to make homemade chocolate cupcakes, it just doesn’t happen at the holidays. 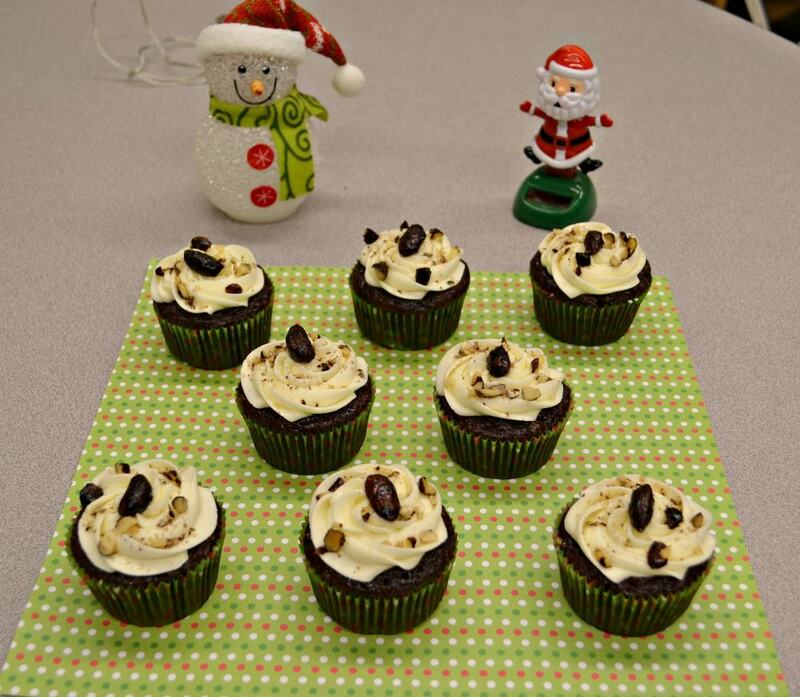 There’s never enough time in between baking cookies and getting ready for holiday parties to make homemade cupcakes. I bought a box of Devil’s Food Cake mix and put my own unique spin on it to give it a more homemade taste. I also added some of the chopped up Planter’s Cocoa Almonds to the batter to give it additional flavor and some texture. The cupcakes came out perfectly. They were rich and chocolatey but much lighter then a traditional chocolate cupcake. 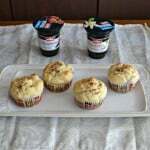 The almonds added a slight crunch to the cupcakes which was perfect. While the cupcakes were cooling I made a fluffy almond frosting to put on top. I piped on the frosting and then sprinkled a few of the Cocoa Almonds on top. They looked really pretty and tasted great too. The sweet almond frosting paired wonderfully with the rich chocolate cake and the best part is they were so simple to make! Preheat the oven to 350 degrees. Line 2 cupcake pans with cupcake liners. Set aside. In a large bowl combine the Devil's Food cake mix, hot coffee, sour cream, water, eggs, and vegetable oil. Mix well until combined. Gently fold in the cocoa almonds. Fill the cupcake liners ⅔ of the way full with the chocolate batter. Bake for 18-22 minutes or until a toothpick inserted in the center comes out clean. To make the frosting place the butter, vanilla, and almond extract in a large bowl. Beat with a mixer on high speed until smooth. Add the powdered sugar a half cup at a time until incorporated. Add the milk 1 tablespoon at a time until desired consistency is reached. 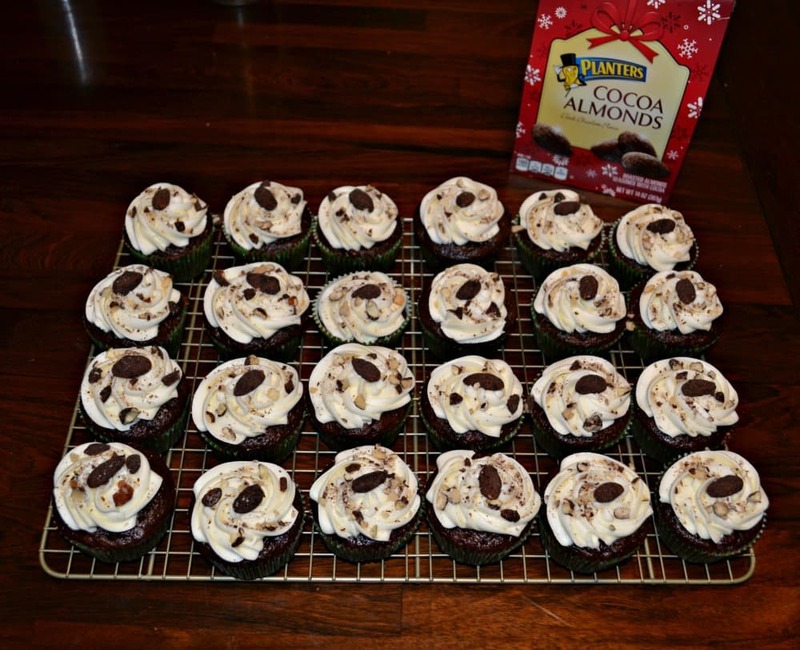 Pipe the almond frosting onto cool cupcakes. Sprinkle with Planter's Cocoa Almonds. If you are looking for more inspiration for the holidays, check out the Cooking Up Good website. There are recipes, sweepstakes, loyaly programs, coupons and more! You can find new ideas for dinner or get a chance to win some awesome prizes! These look great! I really do enjoy nuts for the holidays. And I like the cupcake recipe is from a box. Keeps it simple for me. These look amazing! I bet they taste awesome too! Love that you topped it with an almond! As always your recipes look amazing! Can’t wait to try this one. These look great! I didn’t know about the cocoa almonds. I will have to hunt them down. Love your picture with Mr. Peanut. So fun! Thanks! The cocoa almonds are awesome. The hint of dark chocolate with the saltiness of the almonds is delicious. That sounds amazing! They’re perfect for me to bring with me to the Christmas party I have to go to next weekend! You just put two of my favorite things on a cupcake! 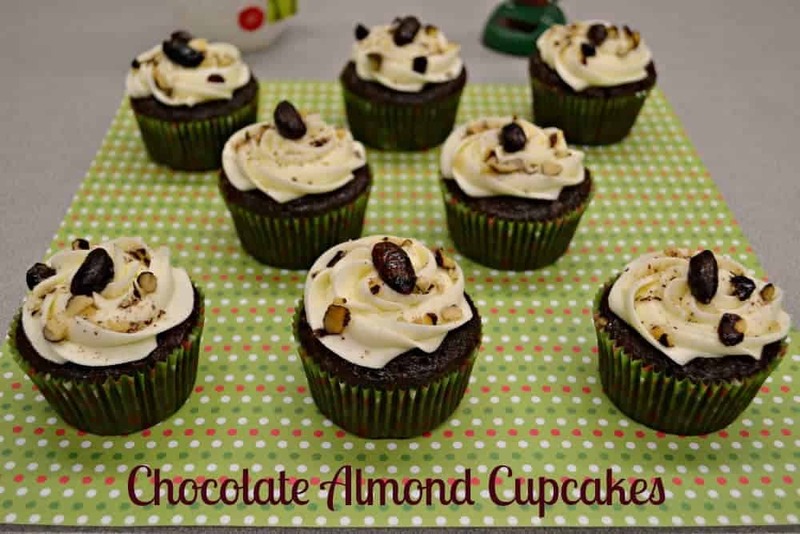 I love chocolate almonds and these cupcakes look amazing! Yum! These almonds sound amazing. I can’t imagine all the fun ways to use these. 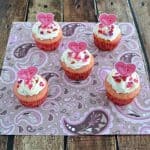 Love the cupcakes- this is always a great way to create some smiles! Oh my gosh this looks delciious. I adore almonds and chocolate together.